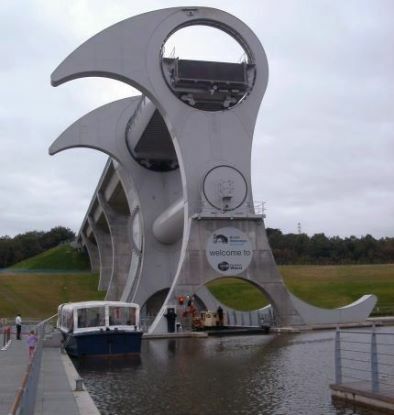 A few years ago, when Luella and I went to visit her son, Joe, in Scotland he took me to see the Falkirk Wheel. It is one spectacular invention. There is a huge museum there to show you how the canal system moved a lot of commerce over a hundred years before the railroads.There are literally hundreds of fancy yachts today that can use this system to move a sizeable luxury ship or boat from the Western to the Eastern side of the land. The first, Canal Forth and Clyde, was built in 1777 between the harbors of Grangemouth and Falkirk connecting Glasgow with the west cost of Scotland. The second, Canal Union, between Falkirk and Edinburgh was finished in 1822. Because of geographical difficulties, which created a difference of 79ft.in elevation, the two canals were connected by 11 locks. In 1963, after 150 years of existence of this water way with 11 locks the construction of a huge water carousel started. 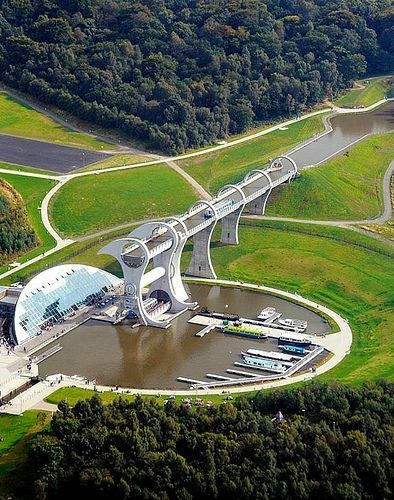 This extraordinary idea was finished in 2002 and became a symbol of Scotland. This invention saves not only time but also energy. 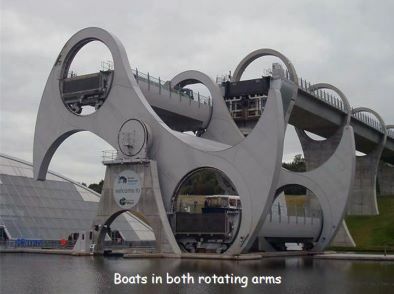 This is the only rotational boat transporter in the world. It has two arms and each arm forms a kind of huge tub filled with water. Boats enter the tub either at the higher canal or the lower one, then the tub locks up and the huge arm starts rotating. Here’s a link to a 7 minute video showing a boat going into the tub and then being rotated up to the upper canal. It is a very interesting place to visit. The canal system is still a very beautiful way to travel across Scotland. It is probably one of the most interesting mechanical devices I have ever seen. It was a fun day. Copyright © 2007 Thoughts From Bob. Paintbrush design by Antbag.